Cupboards, chests and lockers to cover every eventuality including gas bottle / cylinder racks and storage, hazardous storage, mesh enclosures, computer trolleys and secure computer cabinets, and secure storage bins and tool chests. 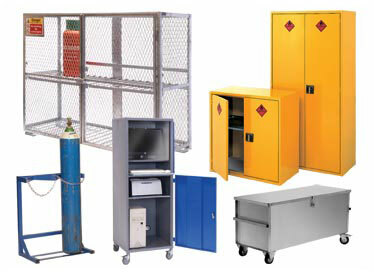 Designed to meet the stringent requirements of COSHH regulations, these chests and cupboards offer safe storage of flammable liquids, chemicals and paint etc. Compact design for secure PC storage with lockable top and bottom compartments. 240v - 13 amp anti-surge distribution sockets with mains connection lead. Multi purpose galvanised bins with sloping tops for secure external storage. General storage for tools and equipment or valuables on site, at the workplace, or in vehicles. Protect equipment or valuables on site. Tough, robust, weather resistant. Available in galvanised or colour finish, secure storage for gas cylinders. For safe, secure storage of gas cylinders. Floor racks, wall racks and cylinder pallets, all with securing chains. Designed to store up to 19kg propane bottles, or similar size.